India chose its first female president Saturday in an election hailed as a victory for women in a country where gender discrimination is deep-rooted and widespread. Good luck to you ma'am. It's nice when these things happen, give you a glimmer of hope that perhaps the world is moving forward. Then you realize your own country is still stuck in the dark ages. Still, it's not clear how much 72-year-old Pratibha Patil - a lawyer, congresswoman and former governor of the northern state of Rajasthan - can or will do in the mostly ceremonial post to improve the lives of her countrywomen. 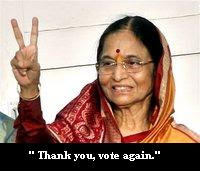 Patil won 65.82 percent of the votes cast by national lawmakers and state legislators, said P.D.T. Achary, the secretary general of Parliament. She had the support of the governing Congress party and its political allies, and had been expected to win. Still a good move forward I would say. Tonight maybe I'll sleep with a smile...and a gun, I always sleep with a gun. So when do you think they will kill her...she's a dead woman. if ever there was a death watch, this is it...there should be a pool on when.